Googlers have a few motorized options for getting around the Mountain View campus: tons of unlocked bicycles and small short range EVs. When it comes to charging the latter, Google is trying out a new system that does away with cords and plugs. 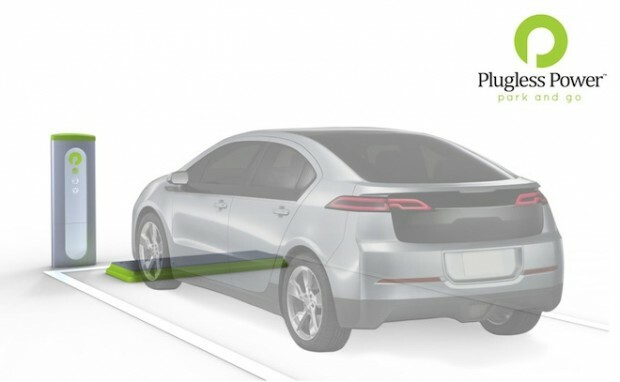 Google is the first customer to purchase the new wireless EV charging station from Virginia-based Plugless Power by Evatran. The system works by exchanging plug and cord for two wireless charging pads. Plugless Power works by inductive charging, a method that has been around for 100 years in electric transformers — similar to what you see in electric toothbrushes and on Powermat. All it requires from the EV is a “simple” retrofit for the car to get the wireless charging treatment. Google plans to use this system on their many short-range EVs and for plug-in vehicles parked at employee car-share program parking spots. Not only will Google be lucky enough to get this technology; Evatran, Plugless Power’s developer, is planning to sell their system to automakers for easy EV charging in the mass market by 2012. WYTHEVILLE, Va.–(BUSINESS WIRE)–Using technology similar to that available in an electric toothbrush, Google is trialing a Plugless Power™ charging station for electric vehicles at its Mountain View, Calif. headquarters. Plugless Power is the first electric vehicle (EV) charging system on the market to offer consumers a simple way to charge their EVs with the ease of hands-free, automatic technology. Developed by Evatran™, LLC, Plugless Power is based on inductive technology, which has been used in electrical transformers for more than 100 years, and streamlines the charging of electric vehicles and extended-range hybrids by eliminating the nuisance of the cord and the plug. For more information about Plugless Power’s unique technology, visit www.pluglesspower.com. Plugless Power™ (www.pluglesspower.com), manufactured by Evatran™, is the first electric vehicle (EV) charging system on the market to offer customers a simple way to charge their EVs with the ease of hands-free, automatic technology. Utilizing inductive technology, which has been used in electrical transformers for more than 100 years, Plugless Power streamlines the charging of electric vehicles and extended-range hybrids by eliminating the nuisance of the cord and the plug. For more information, visit www.pluglesspower.com.